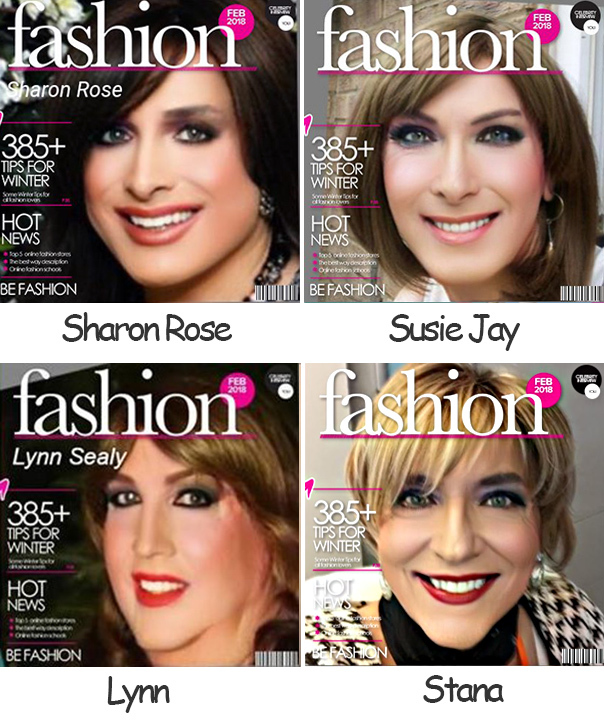 The online app that puts "Your Face on a Glamorous Magazine Cover In Seconds!" seems to be very popular with Femulate readers (and me). More of you have sent in your results, so I am posting a second set of your glamorous images today. I girded my loins for criticism and as expected, I received some comments about my voice. And yes, my voice is deep for a woman. Years ago, I took a femme voice course and after three weeks of practice, I had a very feminine voice, but I always felt silly when I used that voice. It seemed so fake to me. Since I found that my normal male voice was not a deal breaker as far as passing was concerned that is what I decoded to use. I think that when people initially encounter me, they see a woman. If and when I speak, they just assume that I am a woman with a deep voice. After years of using my normal voice en femme, I assure you it usually does not give me away. As I recounted in last Wednesday post, a fellow came over to me after I spoke at the Hamvention forum and asked me how I am related to Stan Horzepa? 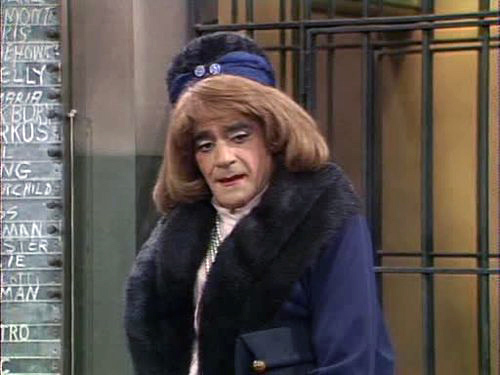 Abe Vagoda femulates in an episode of television's Barney Miller (circa 1978). Don't feel bad about your voice. My speaking voice (bass) is deeper than your voice and yet I still get ma'amed some of the time even when I'm dressed in drab. My hair is down to my shoulder blades and my bra cup size is DD. No criticism or judgement here. TBH I thought it was interesting to hear your voice and accent. It was very nice to see and hear you in the Hamvention video you posted yesterday. You looked lovely, as always. It was a treat to hear your voice. Brava! It was a little disconcerting to hear the manly voice from the pretty woman. I am guessing I would get used to it just like with everything else. Remember the Kinks song, "I don't understand why she walks like a woman and talks like man but that's my Lola"
Your voice does not cut against the image of a woman that you present. As for your accent...as a "New Yawker" I would leave your accent at South Waterbury. A word to the wise when it comes to "online app" that you have advertised. It wants you to log in using Facebook and sends your data to Russia! Cambridge Analytica stole user data from FB using similar mechanism. It asked people to take various "quizes" and used FB data on them and their friends (depending on privacy setting) to manipulate FB feeds. Anyone using this so called "app" will be targeted the same way since you are giving away what they need- looking like a glamorous model on a magazine cover is just a smoke screen to steal your info. Beware- you have been warned! If any of your girls want to see how fab you can look without any real plastic surgery, I highly recommend downloading Portrait Professional. It allows you to manipulate face shape, apply makeup and so much more. It is really very powerful. It is like Photoshop without the complications. Their sister application called Portrait Body allows you to manipulate the body so, for example, you can get anatomically correct figure for a woman in a photo using this software. Trial versions are free- they don't let you save the images or you can buy them. It also allows you to change your background so you can be on a glamor mag cover without having to divulge your personal info to hackers.